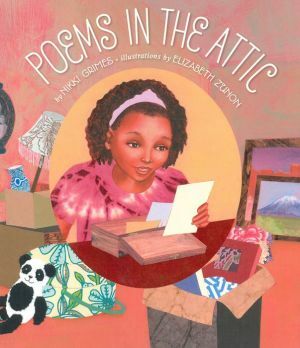 During a visit to her grandma s house, a young girl discovers a box of poems in the attic, poems written by her mother when she was growing up. Her mother s family often moved around the United States and the world because her father was in the Air Force. Over the years, her mother used poetry to record her experiences in the many places the family lived. Reading the poems and sharing those experiences through her mother s eyes, the young girl feels closer to her mother than ever before. To let her mother know this, she creates a gift: a book with her own poems and copies of her mother s. And when she returns her mother s poems to the box in the attic, she leaves her own poems too, for someone else to find, someday. Using free verse for the young girl s poems and tanka for her mother s, master poet Nikki Grimes creates a tender intergenerational story that speaks to every child s need to hold onto special memories of home, no matter where that place might be.